Can you absolutely love a garment? Well, if you can this one ranks right up there. It started with the great pattern which actually took much longer than I ever expected. 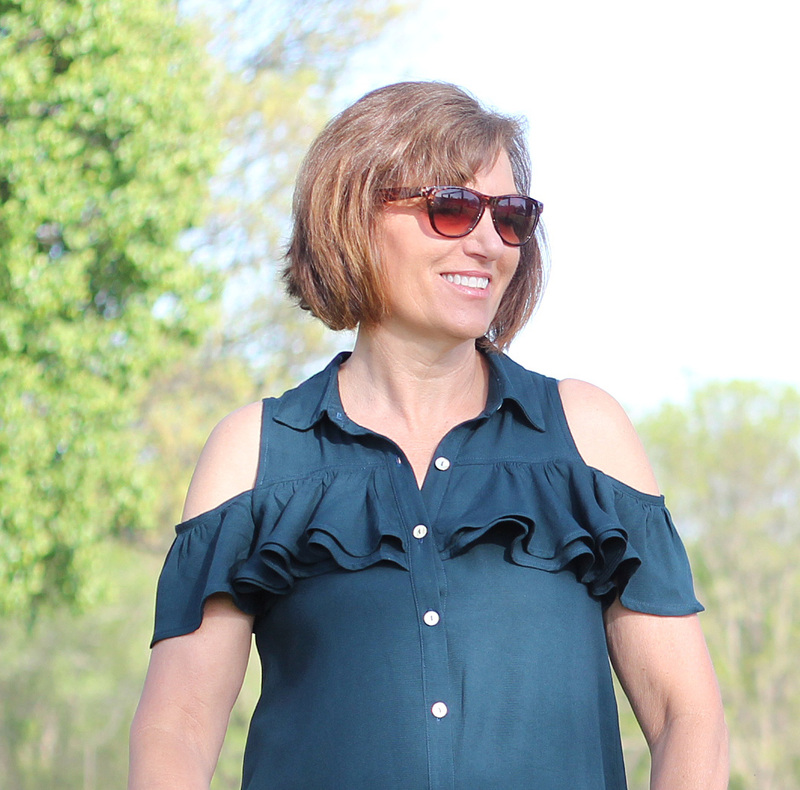 The end result is a garment that I love so much more than I ever expected! 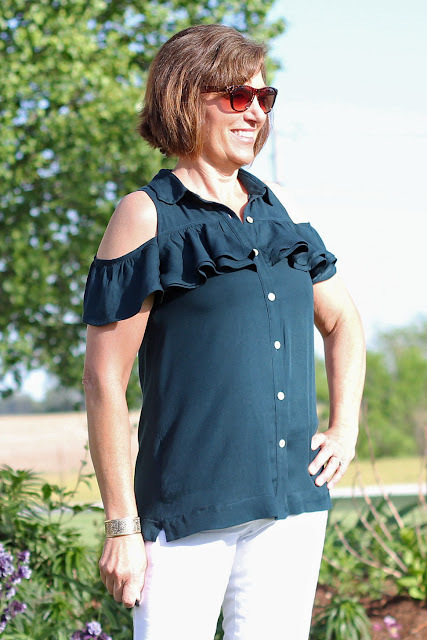 A couple of weeks ago, I pulled out my Simplicity 8341, a Mimi G pattern and knew this was my next make. I went to my fabric collection, which is very small, I think I have about four pieces of fabric suitable for shirts. Only one was the right kind for this pattern and it was perfect, a Rayon Twill Weave from Style Maker Fabrics. According to Michelle's suggested use, dresses or blouses. Bingo - I have my fabric. Now this pattern does not go quickly. First several pattern pieces take time to cut out, then all those ruffles take time to hem and place in just the right place. Hemming the ruffles, I used my serger to finish the hem. I find this gives the fussy fabric a bit of substance and I can turn it up easier. I did turn all the ruffles up twice for a finished look. One thing to pay attention to on the instructions, Mimi G's seam allowances vary. 5/8" to 3/8", so read carefully. I missed one on the collar band and used a 5/8" seam allowance, to compensate, I made a 1/4" on the top of the collar band. One thing I am going to have to fix, is the bust point on the front band. I really feel the button placement is where it needs to be. The top needs a button at the top of the ruffles and at the bottom also. I have some pulling at the bust line. I am going to put a small snap, just hidden in the front band but will take care of the gaping a bit. 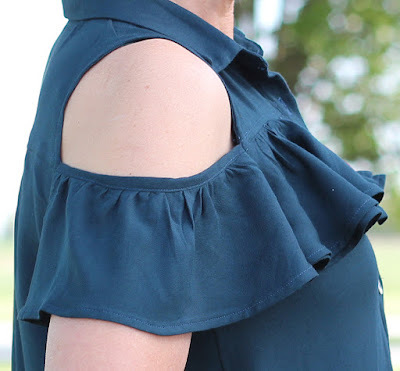 I love the ruffle at the arm. This was a success for a cold shoulder look after I have tried a couple others that were fails. 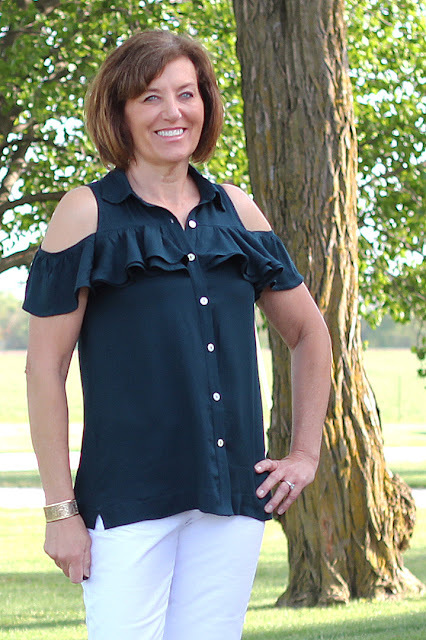 One thing to notice, is this top and dress has a definite A-Line look, so you will have quite a bit of fullness in the midsection. If you don't like that, add some shaping. I found this pattern to be at an intermediate level, the pattern takes time and precision. 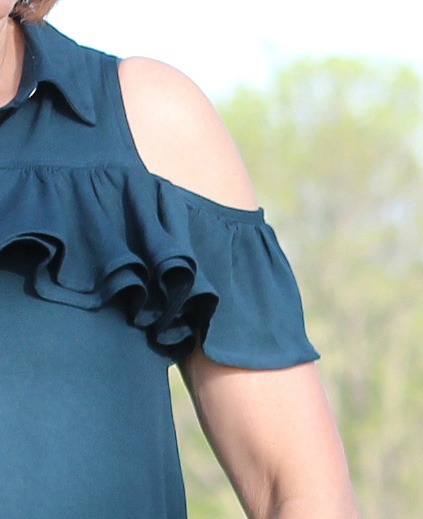 I paid attention that the front ruffles match at front band and that the arm ruffles were at the same starting point on the front and back. These points coincide with the yokes. Also, thanks for the button help via Instagram. I had 5 choices of buttons and this one had quite a bit of popularity. Once again the sewing community is so helpful. I know two things, this top took a long time and I am ready to move onto other project. Secondly, I love this top so much and it quite possibly could be worn out by the end of summer! wow. 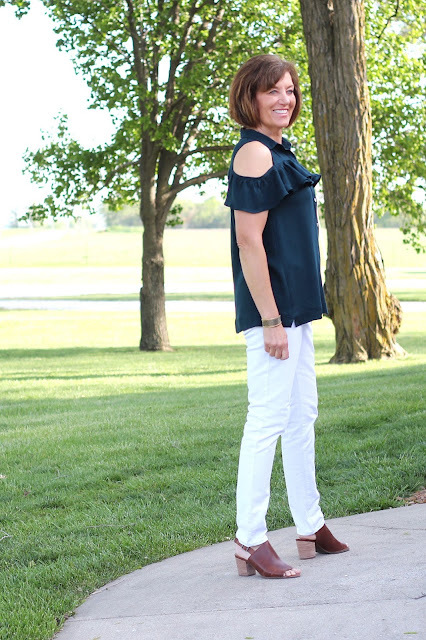 When I saw your post pic on bloglovin', my first thought was that this is the FIRST cold shoulder make I've seen that I like! You look stunning in this. Perfect fit, precision, fabric, and styling. congrats on a lovely blouse! I love this pattern and style. Thanks so much. Looks great. Might have been fussy to make but looks really nice and well made. Thanks so much,it really is a winner. After it is done, the ruffles are so worth it. Looks great, Lori! Your choice of fabric really makes the design stand out well. Thanks, I love this fabric. Love this Lori! Have plans to make it before summer. Great job as usual! Thanks, you need to make this pattern. 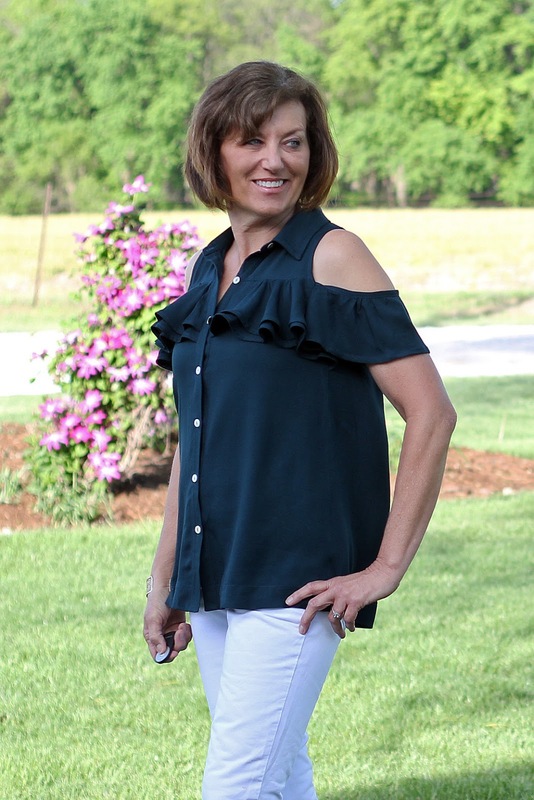 Great top for summer! I love your style and draw a lot of inspiration from your garments. Looking forward to seeing what you make next! Super cute Lori! this pattern slipped under my radar I may just have to pick it up at the next Simplicity pattern sale. Thanks, you need to make this one, it is fabulous. Thanks, I loved making it. It may have taken you a long time to make, but it is definitely worth it. It looks great on you!! You are right, it was so worth it.